In a large bowl, beat softened butter and sugar until it become light and fluffy. Add one egg and mix well. Add vanilla extract and baking powder. Mix well. Add flour and salt. Beat until well combined. Then knead this dough with hand to make a big ball and divide it into two halves. Keep in two separate bowls. In one portion add ground almonds and almond extract (if using) and blend back to a smooth dough. Keep aside. Add cocoa powder in the other half portion, mix well and knead with hand until its smooth. Clean the work space and spread one parchment sheet. Take almond dough and press it on the sheet. Then keep another sheet on top and roll over the dough in half inch thickness, in a rectangle shape. Slightly cut the sides to get the preferred shape. Keep this in fridge for 30 minutes. Likewise, the cocoa dough also prepare like this and keep in fridge for 30 min. Later, take out both the cookie dough and keep the brown one on the work space. Remove the parchment sheet which is kept on top. Then keep the almond sheet on top of the cocoa one. Then keep a parchment sheet on top and roll it slightly to avoid air pockets in between both the dough. Then remove the parchment sheet from top. Start rolling both the dough together tightly and slowly. (Refer the below given video link for demo). Later the dough looks like a cylindrical rod. Roll it in another parchment sheet and Keep refrigerated overnight. Next day, take out the roll and remove parchment sheet and cut the dough into ½ inch thickness and arrange the cookies in an UN-greased tray and bake in a preheated oven in 180 degrees for 11-13 minutes. PS : Recipe says the baking time as 9-11 minutes for the pinwheel cookies. But my cookies were slightly under-cooked, and hence I increased the baking time as 11-13 minutes! You can also try more cookies recipes from our collection. 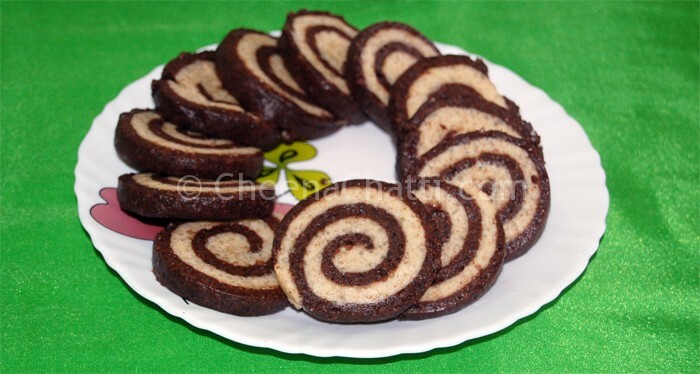 This entry was added on November 19th, 2013 by Athira Sooraj in Bakery and tagged with easy cookies, chocolate pinwheel cookies, almond cookies, cookies, make chocolate pinwheel cookies, pinwheel cookies recipe video, pinwheel cookies recipe, sugar cookies, pinwheel cookies. Last revised on April 4th, 2018.